The annual ‘Art from the Heart’ event was held at SAI Angan on Saturday, February 3, 2018. 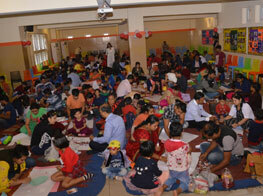 Students from Play Group to Class III participated in the photo collage activity along with their parents. The topic for the activity was ‘Family Tree’, which helps in creating a sense of identification with one’s family and ancestors as well. It also enables the children to understand the various relationships in one family and reinforces in them a bond with other members of the family. Around 175 families took part in the activity, creating magic with their hands and strengthening the spirit of togetherness.